International customers, please see note below!!! 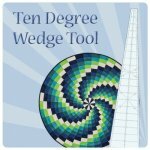 The Ten Degree Wedge is THE go to tool for creative quilters! 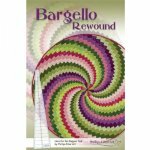 Free with the wedge tool is dynamite Bargello design ideal for beginners! 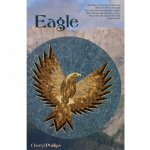 When you buy the tool, you can start on a project immediately!! 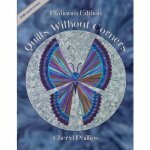 The wedge is used in the book, Platinum Quilts Without Corners. 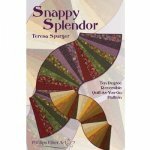 Patterns using the Ten Degree include Angelica, Eagle, Phoenix, Stellar Medallion, Bargello Rewound, Snappy Splendor and Spicy Spiral. 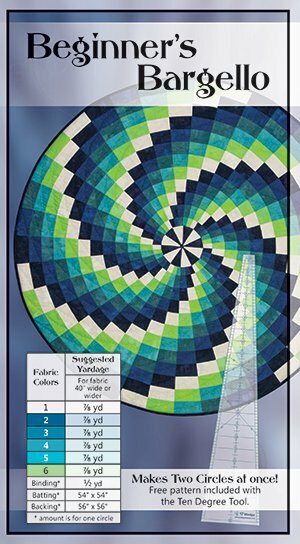 We also offer many free ten degree patterns as easy downloads. Please select a Two Piece Ten Degree rather than the full length version. This tool is not available to International customers due to the oversized package increasing shipping cost. The Two Piece Ten Degree will work in the same and will save you money! 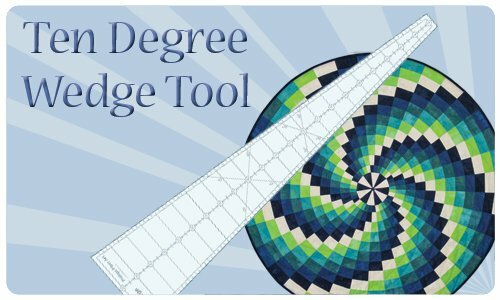 You need 36 wedges to make a complete circle. Wedge is 22 1/2" long, allowing 5 3/4" center. Completed circle is 50 1/2". Angled lines, 45 & 60 degrees, printed on tool.